'Tis the season to be sociable, but why go out when you could host the perfect party with these tips and tricks? Picture the scene: you're hosting a New Year's Eve party; the tree’s seen better days, the dog pulled down the fairy lights weeks ago; every surface in your kitchen is covered in plastic tumblers and the alcohol stash that actually emptied your bank account suddenly looks like nothing; there are sad bowls of crisps dotted around your living room. Sound familiar? It’s a party. You want it to feel like a party, so as well as a mountain of pigs in blankets and enough mulled wine to fill a swimming pool, that means oomphing up the Christmas decorations. We have put together loads of festive decorating ideas so hot foot over to those for some inspiration... Otherwise, plenty of fairy lights (don't miss our design ideas - and see below, too) and over-sized paper baubles (see below) will add a splash of colour. If you know your party will spill into rooms that make don’t get as much attention when it comes to New Year's decor, just be sure to string up some fairy lights to keep the festive mood. 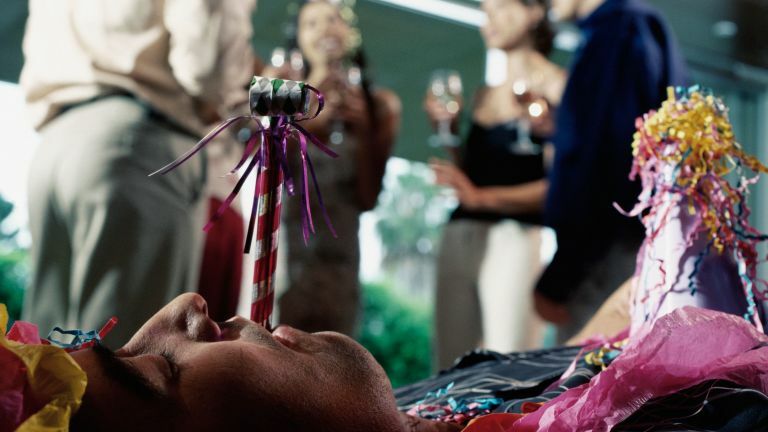 Plus, no party will go with a swing if the lighting is too bright (party rule number one). Why not steal this idea from @island_supply_co and pin some lights and evergreen bits along your kitchen shelves. Simple but super effective. Spent ageing trying to make your home smell like Christmas? All of the festive smells are perfect for New Year's Eve, too. Or, pick a good reed diffuser (our pick of the best is legendary) or winter-scented candle. It's worth investing in a good air freshener, too, because that loo is going to be used rather a lot (sorry). Speaking of the kitchen, we all know that at any party it tends to be where it’s at. So prepare for that. Beyond making sure it’s clean and tidy, ensure there is a good ambience in there – bring some bedside lights down and dot them around the room, light a few candles, make sure there is some form music. You could pinch this idea from @hardcastletowers and adorn your ceiling with paper snow flakes – you could of course make your own but you can also pick them up from Wilko for just 80p! No longer a relic of a bygone era, the bar cart has long shed its Abigail's Party-esque past and become one of the most coveted pieces of furniture going. We’ve rounded up some of our favourites so you can go and find the best bar cart to suit your style and budget. Alternatively, you could definitely just jazz up a sideboard or even a coffee table using these 10 tips for styling a drinking cabinet/bar cart/corner of the kitchen table/wherever you can find room for all the booze. Because all good tipples are shaken not stirred, so if you only choose to invest in one piece of barware make it a cocktail shaker. The key with cocktail making at a party is not too get too carried away. If your mixology skills go about as far as a gin and tonic, then don’t buy all the ingredients for a Long Island Old Fashioned Bloody Mary Iced Tea. Keep it simple. Research two or three different classic cocktails that will please the majority of people and have a few practices before the big night. Your mixing bowl is going to be out anyway, so once you've whipped up some bakes for everyone to snack on, wash out the bowl and fill it with punch – you can use up all that leftover Christmas booze. Or maybe make two: one for drinkers, one for drivers. Why make a punch? Well, it's more exciting to drink something a bit different and the alcoholic one can get the party going really quite swiftly... (just make sure you label them). Looking for easy recipes for bakes? We've found some lovely Swedish festive bakes that are easy to make en masse. Freezing grapes and berries rather than ice cubes to add to drinks has three distinct advantages: first, the berries make the drinks look (and taste) festive; second, you can free up fridge space by not having to chill as many wine/fizz bottles; third, the berries don't melt and dilute the drinks with tasteless water. Putting ice cubes in a bucket for beers? Swap them out for frozen water balloons. They do the job just as well but avoid that big wet patch on the floor as dripping bottles are taken out of ice. If you are having a sit down meal as part of your gathering, then make sure the table is dressed to impress. This doesn’t have to cost a bomb and it doesn’t have take too much effort either. You could do something as simple as strewing your table with some evergreen and lighting a few tapers. Go and check out our table setting ideas for more inspiration and find out how to set a table for a special occasion, too. Upgrade from playing music from your laptop and invest in some good quality speakers. Something that’s portable like the Ultimate Ears Wonderboom would work – it’s super small but the sound is impressive. You could also choose smart speakers, that will take the responsibility off you and let everyone pick their own music depending on where the vibe of the party is heading. If you don’t fancy the chaos of everyone shouting ‘Alexa play Destiny’s Child’ maybe plan your playlist in advance instead. Try and anticipate the mood at different times of the evening, start with the typical festive tunes and then BOOM two hours in hit them with Crocodile Rock (or something similarly doubtful). Just don’t force it – this isn’t Freshers' Week. Dot some quick-fire party games/a karaoke machine around the house and let them arise naturally when the time is right. John Lewis have a huge selection of party games, as do Firebox, if you are after something less er… PG. Add some glitz and glamour with a DIY photo booth – all you need is bright-coloured fabric to use as the backdrop, some nice lighting (fairy lights are amazingly forgiving on tired/hungover complexions), and a Polaroid camera (or your phone). Yes, really. After midnight everyone gets the munchies, so if you're not serving food early, and the party's due to go on (and on), food around then is a must for a) fuelling their energy into the wee small hours or b) ensuring they sober up a little. No one wants to be rustling up tasty treats at that time of night, though, but prepping soup/a chilli con carne/slow cooked pulled pork in the afternoon and putting on slow cook will make it effortless. Plus, we reckon that if you don't use yours for food, it'll be great for keeping mulled wine toasty. Aaaannnd, it'll be a valuable investment for January when you're trying to stick to that healthy eating resolution. Don't miss our pick of the best slow cookers for hearty meals. Seriously, it's worth putting £50's worth of party budget towards a cleaner coming in the next day. Believe us, we've tried cleaning up a wrecked house with a hangover. We've also tried going out for brunch while a grateful teenager earns a few extra £££s doing the cleaning. The latter approach wins every single time. At the very least, we beg you to consider investing in our pick of the best upholstery cleaners or the best vacuum cleaners. The best plan for New Year's Eve? Planning for every eventuality. The people who were going to stay over may well end up going home (so make sure you have local mini cab numbers ready), and those were adamant they would leave early may end up staying over, so have extra blankets/cushions ready to make them comfortable. Happy partying! Looking for more party inspiration?